Just a mile away from the Sagamore Resort and all of the restaurants and shopping of Bolton Landing, this townhouse has all the amenities to make an incredible vacation in the Adirondacks. This beautiful and newly updated townhouse has 3 bedrooms, 3 1/2 bathrooms, newly renovated kitchen with everything needed to make a home cooked meal, 3 skylights to gaze at the stars, and a gorgeous view of Lake George. The master bedroom has a walkout to its own private deck, a king size bed and en suite bathroom with a huge soaking tub. The second bedroom has 2 twin size beds, incredible windows, and access to its own bathroom. The third bedroom has a queen size bed and a twin size bed and the most amazing views of the lake. It also has access to its own bathroom. All bedrooms have a smart TV, heat & AC, and unique views. The deck on the main level has a grill and a table and chairs along with Adirondack chairs to help take in the view as you bbq. There are brand new appliances including a dishwasher and laundry washer and dryer (linens and towels are not provided). It doesn't stop there. Amenities include a beautiful heated pool, tennis courts, fire pit, small playground, and a private drive down to the docks where there is a small beach, lounge chairs and a dock. The boats and boat spaces are not available to renters but there are marinas nearby starting within walking distance. Close to everything you could ever want, this is sure to pamper you and your family and provide memories to last a lifetime. Jim and his family have been vacationing in the Adirondacks for years. They enjoyed it so much that they decided to make it a permanent vacation spot. Each detail of this newly renovated townhome has been carefully thought out. It has been an effort of love and hard work and we hope it can bring others the same satisfaction it brings to our family. 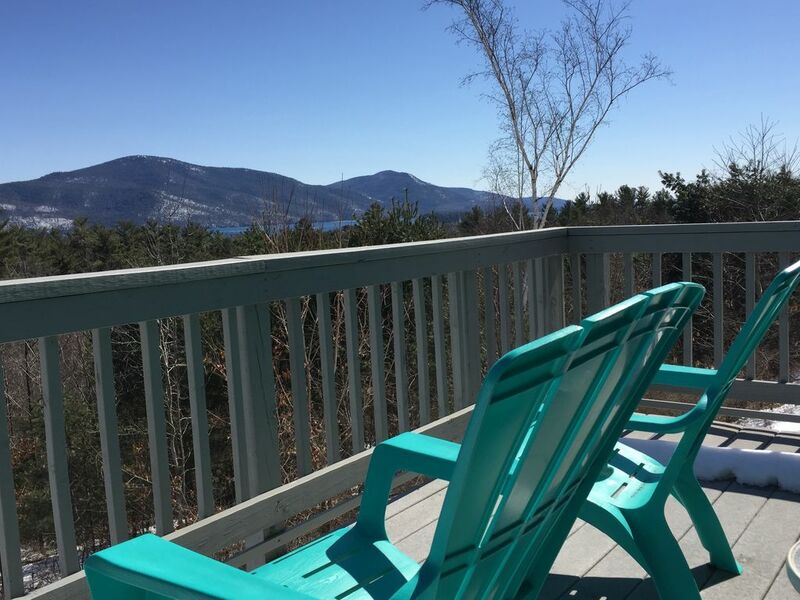 Feel the stress leave your body as you sit in an Adirondack chair and take in the best view of Lake George and its majestic mountains. Make a home-cooked meal in the well-equipped kitchen and/or bbq or go to one of the many excellent restaurants that are in Bolton Landing. Weekly fireworks can be viewed easily from the deck or from the comfort of the couch. Amenities like a heated pool, tennis courts, basketball courts, and a fire pit are within steps. There is no shortage of things to do. Juniper Hill has its own small beach with access to the water (no lifeguard). There are also decks with bbqs, lounge chairs, and tables and chairs with umbrellas. Lake George is a short walk down a private road to the docks. The lake can be viewed from almost any window of the townhouse. There is also a breakfast counter. Jim and his wife Jennifer have a lovely home in one of the best locations on Lake George, just up the hill from Bolton Landing. Me and my children drove from Washington DC for a wedding and we couldn't have been more pleased with our home away from home for the weekend. I highly recommend you stay here on your next visit to Lake George. This property was wonderful for our annual get together. Very clean, beautiful view from deck, quick response from owners. The beds were a bit too firm for us. But that aside, we really enjoyed our stay here. Wonderful condo with beautiful views and amenities. There are a number of trails to hike nearby as well as a clean public beach. Plenty of restaurants and shopping in the village of Bolton (3 min drive). Highly recommend! Our adult daughter suggested that we revisit the Lake George region. She fondly remembered the summers that we had spend in Bolton Landing with her and her brother during their childhood. We saw this condo during our online search and reserved a week's stay in late August. The condo was everything that we had hoped for. We were six adults and the condo had three bedrooms with a bathroom for each bedroom. It was clean and beautifully decorated. We were able to see the lake and the beautiful mountains from the upper deck of the condo. We had access not only to an excellent variety of cutlery, pots, pans and dinnerware but also to K-cups, spices and condiments. Cable and air conditioning worked efficiently and continuously. The washer and dryer were high tech and accommodated all of our laundry needs. The owner was very helpful when we arrived. He gave us a tour of the condo and helpful recommendations for restaurants and things to do. We never had to contact him but he let us know that he would be readily available if we needed him. We were also able to relive our wonderful memories of miniature golf courses, visiting Fort Ticonderoga, spending a day at the Saratoga race track and of course all of wonderful hiking, swimming and boating activities that were all around us. The location of the condo was perfect for access to all of these activities. It was also far enough away from the heavily trafficked tourist areas which were still reachable within a short drive. All in all it was a perfect week at a perfect condo. The condo was great- beautiful views, sparkling clean and totally updated. The condo is very spacious and comfortable for a family. It is a mile to Bolton Landing to shops and restaurants. A short walk to a small beach/marina with reclining chairs to enjoy the views- I was there for 3 days with my adult children who were happy to relax and read on the deck and down by the water- we rented a boat and had a wonderful time. Once they left I was joined by 3 girlfriends who were happy to explore Bolton Landing and Lake George Village. It was a great vacation, and I would stay at 13 Juniper again- it couldn't have been nicer. The owners Jim and Jennifer were available for any questions- I recommend without hesitation! Great time in a great place! Jim and Jennifer's place is beautiful! We really enjoyed our stay. Jim and Jennifer thought of everything to make our stay enjoyable. We loved the location, especially the dock. We loved the view of the lake! The village of Lake George is 15 minutes away. Six Flags Great Escape is about 20 minutes away. Extreme Adventure is about 4 miles away. The town of Bolton Landing with shops and restaurants is less than a mile away. No pets. Absolutely no more than 6 people at any time. No smoking anywhere on premises including the deck and front walkway. No parties. This is for family vacations or couples.